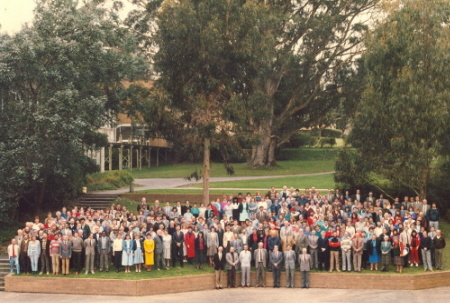 After thirty-nine years of service to the University of Ballarat and its predecessor institutions Verna Barry retired from full-time work on 31 January 2000. Her incredible contributions to her workplace took place during the transition of tertiary education in Ballarat from technical education to University. Verna commenced worked as a typist at the Ballarat School of Mines (SMB). In 1965 she became private secretary to Jack Barker, Principal of the Ballarat School of Mines and later Director of the Ballarat Institute of Education (BIAE) and the Ballarat College of Advanced Education (BCAE). A trusted and loyal member of staff, Verna was devoted to her job, her workplace and greatly respected Jack Barker with whom she worked loyally for many years until his retirement in 1987. In 1988 Verna was appointed Administration Officer with Engineering Faculty. She spent five years with Engineering Science from 1990, and in 1996 worked for Information Technology & Mathematical Science (ITMS), becoming a key member of the Research Support team. Upon her retirement she was thanked in the ITMS Research Newsletter (edition 12): 'Verna undertook administrative duties related to research and worked tirelessly with great care and precision. Thank you Verna for your assistance and all the best for your retirement.' Greatly respected by her many colleagues Verna Barry continues to work on special projects for ITMS. This biography prepared by Clare Gervasoni, March 2006, with thanks to Chris Baker and Gaye Curtis.